Garlicin / 60 Tabs - Nature's Way®. SmartRelease® Garlic Using a proprietary enteric-coating, Garlicin tablets are protected from stomach acid. Once in the intestinal fluid, Garlicin tablets completely disintegrate in about 45 minutes providing maximum allicin release. SmartRelease® enteric-coating ensures tablets survive stomach acid and disintegrate in the intestine. Take 1 tablet two times daily with meals. Do not chew or crush. Do not use this product if you have a bleeding disorder, are taking blood thinning medication, or are within a week of any surgical procedure. If pregnant, nursing, or taking any medications, consult a healthcare professional before use. Superior blend of EPA and DHA. 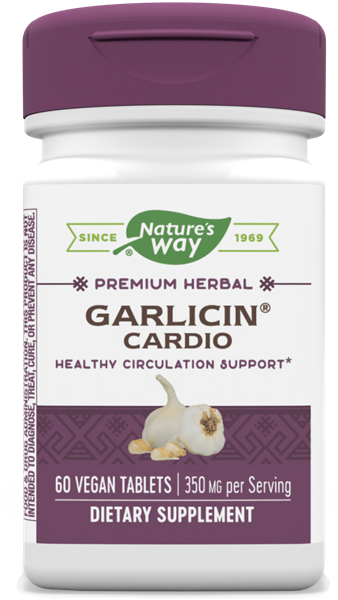 Combines all the healthy benefits of Garlicin® with the added benefits of Echinacea, Vitamin C and OptiZinc®.